If poetry registers ‘internal difference, Where the Meanings, are’, in Emily Dickinson’s deep phrase, then indigenous poetry creates meanings that are more different still. Growing from an alternative poetics that questions conventional procedures and challenges what we know, indigenous poetry gives us a chance to change. That is true whoever or wherever we are, Indigenous, indigenous or invited in. It may be more broadly true, across other art forms too, but to start from poetry, if poetic language is speech at its most highly charged, then in indigenous poetry there’s a glimpse of a potential for overturning and renewal. Dominant practice has its own built-in obsolescence. Paradoxically, given its acknowledgement of the timelessly old and absent, indigenous poetry suggests a new way forward. 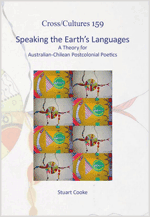 How that might happen is expounded by poet, translator and scholar Stuart Cooke in Speaking the Earth’s Languages: A Theory for Australian-Chilean Postcolonial Poetics. Both a befitting modesty and a huge ambition are indicated in that title. As we seek ways to speak – meaning to hear and understand as well as to give voice to – all the languages of the earth, especially the endangered and marginalized, are we also learning to speak, through an altered understanding of the ecology of utterance, the language of the earth itself? The author begins from an image and an insight into the condition of being indigenous under colonisation: ‘a new set of expectations is placed over their world like a thin cotton sheet … everything is covered by its white topography’, wrapped, ‘as if the land and its occupants were the dormant forms of something not yet realized’. That ‘as if’ ‘is a fundamental epistemological error’ says anthropologist Deborah Bird Rose, quoted here by Cooke, referring to Aboriginal Australia. The same is true elsewhere, where one imaginary smothers another: ‘in the intricate evasions of as’, in Wallace Stevens’s phrase in ‘An Ordinary Evening in New Haven’. That ‘error’ is the basis on which, in the book’s boldest move, Aboriginal people are brought together with the Mapuche of southern Chile in an ‘inextricable proximity’ via their shared histories that yields ‘an emergent, trans-Pacific indigenous poetics’. The discussion is avowedly ‘circuitous’ and speculative, yet its parabolic arcs are illuminating, spiraling in and looping out wide. The advent of imperial invasion is nothing ordinary, of course, but as strange as another image of a white sheet, the wrapping of Little Bay in Sydney in 1968-69 by conceptual artists Christo and Jean-Claude. Reflecting on the inadequacies of the exhibition Australia staged at London’s Royal Academy in 2013, art historian Ian MacLean cites that missing Wrapped coast as a transformative work for drawing ‘attention to what lies beneath the land rather than to its scape’. It resonates with what Aboriginal people call country, a conception developed in Australian writing in Reading the Country: Introduction to Nomadology (1984) by Kim Benterrak, Stephen Muecke and Paddy Roe, one of the guiding texts in Speaking the Earth’s Languages. Cooke’s strategy is to focus on two Aboriginal poets, Paddy Roe and Lionel Fogarty, and two Mapuche poets, Lionel Lienlaf and Paolo Huirimilla, whose work represents different approaches to the blending of traditional language and cultural knowledge with their respective literary mainstreams of English and Spanish. He precedes these investigations with a re-reading of the most canonical of those mainstream poets, Judith Wright and Pablo Neruda, commonly heard as voices of support for the indigenous presence in their settler worlds, but here provocatively constructed as barriers that their successor indigenous poets must overcome. Even in mid-summer, the frogs aren’t speaking. Their swamps are dry. In the eggs a memory lasts. They will speak again in a wet year, a year of mosquitoes. The grass will seed on that naked patch of earth. This entry was posted in BOOK REVIEWS and tagged judith wright, Lionel Fogarty, Lionel Lienlaf, Nicholas Jose, Pablo Neruda, Paddy Roe, Paolo Huirimilla, peter minter, Stuart Cooke. Bookmark the permalink. Nicholas Jose writes fiction and essays. His publications include, as general editor, the Macquarie PEN Anthology of Australian Literature. He is Professor of English and Creative Writing at The University of Adelaide.